When people say to me “things were so much better in the eighteenth century,” they tend to mean either that Enlightenment ideas like abolishing slavery were so prevalent then or, conversely, that it was a time when events like the Boston Tea Party established the great American traditions of not paying taxes and relying on private charity to fund public goods. In the research for my book Slavery and the Making of Early American Libraries: British Literature, Political Thought, and the Transatlantic Book Trade, 1731-1814 (Oxford UP, 2019), however, these seemingly distinct liberal and neoconservative outlooks on the period come to resemble one another. The research for this book, made possible by an American Society for Eighteenth-Century Studies (ASECS) Fellowship at the Library Company and through grants from the NEH and other institutions, establishes that the books imported from London that gave rise to these ideas were paid for from the proceeds of slavery and related enterprises. As with Brown, Harvard, Yale, Columbia, Princeton, and even Georgetown, the household and institutional libraries founded in the same period as these universities were able to obtain these imported books from the membership and philanthropy of men engaged in these businesses. I have documented Pennsylvania men’s transactions with slave plantations through papers available at the Historical Society of Pennsylvania and American Philosophical Society, and evaluated their reading tastes and habits via the Company’s circulation receipt books. Indeed, one can see this Philadelphia pattern manifest in the commerce and charitable institutions up and down the East Coast in the colonial and early Republic periods by simply cross-referencing the membership rolls of these libraries with the business papers of such men and their families. These records – the best evidence of early American consumer society – reveal that early Americans were immersed in the consumer revolution of the Atlantic world in the period, trading goods through complex transactions with Portugal, Spain, Madeira, Cape Verde, Africa, and the Caribbean and bartering them for imported British commodities and fashions. In establishing that books containing Enlightenment and Counter-Enlightenment ideas were imported from Europe via slavery profits, this scholarly project has effectively said to liberal and neoconservative aficionados of colonial America, “a pox on both your houses.” The political elite – the “chattering classes” – in early America received their education from institutions funded by this kind of economy and philanthropy, so it is appropriate to call the study of the transatlantic book trade a means to bridge economic and ideological interpretations of the Revolution. The ideological interpretation, to be sure, has been the most prevalent for more than fifty years, with scholars like Bernard Bailyn, Caroline Robbins, and J.G.A. Pocock arguing that contemporaries formulating the definition of virtuous leadership believed that land ownership rather than other economic means of support created the ideal citizen. This neoconservative scholarly consensus, however, blanches when the slaves that worked that land are now visible as the ghosts that stalk the study of the history of British political thought. In a parallel fashion, liberal defenders of founders who took more enlightened views towards slavery can now be seen as hypocritical. These eighteenth-century men’s profits from slavery were paying for the importation of the very books of Enlightenment political theory, literature, and other genres that helped produce an idealistic, but patently disingenuous statement like “all men are created equal.” The Declaration of Independence, after all, was written mostly by Thomas Jefferson – a major Virginia slaveholder whose erudition and large household library were funded by the proceeds of his plantations. 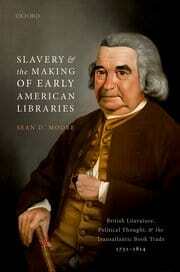 The proprietary subscription libraries I study in my book – the Salem Social Library and Athenaeum, the Redwood Library of Newport, Rhode Island, the New York Society Library, the Charleston Library Society of South Carolina, and the Library Company of Philadelphia – were central venues where these ideas of revolution and abolition were explored. It is not possible to overstate the significance of these centers of reading to the consolidation of the economic, cultural, and political leadership of the colonies and the wider Atlantic world. The “library books represented an important thread in the social fabric and helped cement the social elite” of seaport cities, writes Isabelle Lehuu, creating a common set of values, assumptions, and, at the very least, topics of conversation that served to reinforce the shared economic interest in slavery of library proprietors. Their function may not always primarily to have been reading, but also the furtherance of the businesses of those involved—people whose good taste in books enhanced their reputations and, therefore, their commercial networking prospects. They were, therefore, an important part of the associational culture sweeping the Atlantic world at the time, and so should be regarded as central to the cultural history of the English-speaking world. As Mark Towsey and Kyle Roberts have pointed out, libraries across this oceanic community served as “venues for conviviality and social networking, and as fulcra for other kinds of civic behavior, including philanthropy, social reform, and cultural politics.” These institutions’ blending of civic, financial, and cultural functions provides the basis for Slavery and the Making of Early American Libraries’ efforts to tie together the analysis of such libraries by reference to their effects on early American civic engagement at the time of the Revolution. The Library Company of Philadelphia is a good example of how to study these libraries in that it is exceptional among the others because its earliest proprietors not only consisted of individuals involved in slavery and related enterprises, but also included abolitionists like Anthony Benezet from its earliest days. It is also exceptional in that the Junto, the quasi-masonic club that founded the library in 1731, explicitly intended it to be a civic institution for the improvement of trade as well as of knowledge; its members were frank in establishing the library as a club for businessmen as much as a place for books and learning. This commercial role is borne out by evidence that shareholders were engaged in extensive business dealings with each other, particularly in the West Indies trade in slaves and their products. The Historical Society of Pennsylvania’s Letterbook of the merchant and Library Company shareholder William Fisher, for example, gives an expansive view of Philadelphians involved in the trade in slave-produced goods at mid-century, mainly through the profits they derived from exchanging their crops for the products of plantations in the Caribbean. The Library Company’s Shareholder Records ledger was instrumental in this discovery, because I could see that those Fisher was writing were also library proprietors. By virtue of Fisher’s letters to several Company members, while on a trade mission to Barbados, informing them that he had sold their flour for sugar, molasses, and rum, we can see how the library functioned as a business hub. Some of the identifiable names of these Philadelphia correspondents include James & Joseph Morris, Lenard Melken, Joseph King, Daniel Stonmottz, John Rush, Christopher Marshall, Joseph Baker, Jeremiah Warder, Samuel Mifflin, Joseph Stretch, Thomas Leach, Francis Richardson, Jacob Winey, Robert Waln, Evan Morgan, Edward Warner, and Samuel Palmer. Many of these men were current or future Library Company shareholders, underscoring the fact that though the library was what the Digital Humanities is calling a “reading network,” it was also a social network for the promotion of Philadelphia businesses and their owners. In its other role as a repository of books, the Company, by absorbing other libraries over the course of the century, was inexorably becoming the center of reading for the city. Its history bears witness to how it not only was the center of reading for colonial Philadelphia, but also the cultural center of the mainland colonies during the colonial period and early Republic. As James Green has established, by the middle and late eighteenth century Philadelphia was a major destination for imported books from London and across Europe, and had a thriving printing and reprinting industry led by such individuals as Benjamin Franklin, David Hall, Robert Bell, and Zachariah Poulson, a printer who also served as the Company’s librarian for many years. The city was home to America’s second newspaper, and soon had numerous papers and presses serving the area as well as neighboring colonies. Philadelphia had, by 1770, displaced Boston as “the center of book production and distribution” in the colonies, and many printers also worked as booksellers, with imports dominating the Philadelphia book trade by mid-century. Members of the book trade were more likely than not to be members of the Library Company, to the extent that, according to a brief history of the Company published in 1995, “Philadelphia printers borrowed the English imports and used and abused them to such an extent that a by-law was passed in 1805 declaring that printers would be sued if they took the Library Company’s books apart in the course of reprinting the work.” There were numerous institutional libraries such as those of churches and large personal libraries among the wealthy, some of which the Company eventually acquired and added to their catalogs, and the city also hosted several other library companies that would eventually be folded into the Company. In short, almost all Philadelphia reading eventually led back to the Company, establishing it as not only the central space of reading in the city, but also as a powerful social network of the literate and, usually, wealthy population. That this network counted many people connected in some way to slavery provides insight into the economic basis of the library in the hand-press era, as well as the movement away from slavery, evidenced as much by the anti-slavery activities of some members as by the abolitionist titles the library was acquiring. As a civic institution, accordingly, it straddled the worlds of enslavers and those who would end slavery, making it a unique forum among early American libraries for civic engagement not only around economic and political interests, but also for the contemplation and promotion of human rights. The central Library Company holding I worked on while a fellow there in the summer of 2016 were the “Circulation Receipt Books, 1794-1812.” After talking to Librarian Jim Green, it became apparent that no one had done an analysis of these borrowing ledgers, let alone transcribe them, so I saw an opportunity to do so. I discovered that though the name of each borrower on these receipts was cut out when they returned the book, the other information about what they borrowed and when they did so was not, and that the deposits to take out a book and the names of those who were giving the deposits were recorded on the back of the receipts. I transcribed most of these receipts up until 1800, and then only transcribed titles of books borrowed for the period from 1801-1812 due to the fact that I was running out of time on my fellowship. One of the things that I learned from this process is that shareholders were not the primary borrowers listed in these ledgers; there were only about 20 of them identifiable, meaning that most of the books checked out were from visiting readers. This fact can either confirm that members were more interested in the library as a business network than in reading, or that they were following library rules that they could borrow without deposit up to the value of their share in the Company, or both. The Society for the abolition of slavery being possessed of some valuable pamphlets, in prose and verse, calculated to excite the feelings and engage the understanding to oppose that practice, they have thought no place of deposit so proper as your library. By their Directions I do myself the pleasure to transmit them to you, in four bound volumes, and, I trust, they will be an acceptable and interesting Addition to your valuable Collection. Presents were received as follows, viz. 1) La Cause des Esclaves Negres. Par M. Troffard 2 toms. In short, the Company was stocking more abolitionist books than any other American proprietary subscription library in the period, confirming that it was not only exceptional in being openly formed for both business and reading purposes, but in having abolitionist shareholders among its membership. It is this kind of research and discovery, and publications like Slavery and the Making of Early American Libraries explaining them, which Library Company Fellowships make possible. The act of concluding what this research means for our understanding of conflicts over interpreting the eighteenth-century and its books, and for how those interpretations are politicized by those seeking legitimacy for their opinions in the founding period, is not without controversy. What is clear is that what I am calling “slavery philanthropy” was by far the most valuable charitable source of funding for non-profits in early America, particularly for cultural institutions, and that we can no longer tolerate moves by both liberals and neoconservatives towards making private charity the only source for financing learning and the arts. Nineteenth and twentieth-century reformers of all persuasions helped to create taxpayer-funded schools, libraries, and universities, which liberated learning from the grasp of the very rich and made it available to a broad public. The lesson of the slavery philanthropy past is that the often unseemly sources of such charity certainly can teach us a set of ethics regarding what gifts we should accept for ourselves and for our institutions. But the history of what many project to be the politically neo-conservative and economically neo-liberal fantasy age of the founding period, an era prior to publicly-mandated and supported libraries and universities, may be back where our society is headed if we do not stay awake. As both conservatives and some liberals in many nations attempt to set public policy in the direction of low taxes and charity-only public goods, new questions must be asked about possible agendas that come with charitable gifts and about the sustainability of a post-public society.